The art of Theo Jansen really is incredible. Jansen is a dutch artist and kinetic sculptor; he creates large sculptures which resemble skeletons of animals. 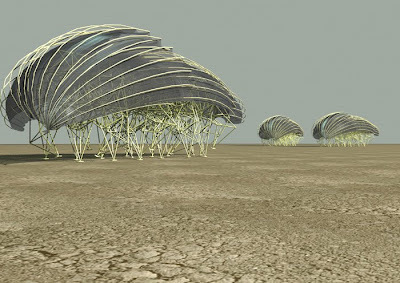 These harness the power of wind on the beaches which enables them to move. It is when you actually see them move that you realise that his work is a complex mixture of art and engineering. He creates them through the use of genetic algorithm. 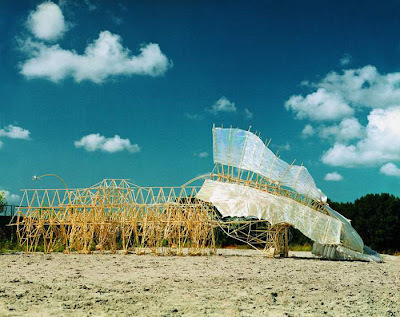 Jansen states "Since 1990 I have been occupied creating new forms of life. Not pollen or seeds but plastic yellow tubes are used as the basic material of this new nature. I make skeletons that are able to walk on the wind, so they don’t have to eat. Over time, these skeletons have become increasingly better at surviving the elements such as storms and water and eventually I want to put these animals out in herds on the beaches, so they will live their own lives." "Self-propelling beach animals like Animaris Percipiere (see above) have a stomach . This consists of recycled plastic bottles containing air that can be pumped up to a high pressure by the wind. This is done using a variety of bicycle pump, needless to say of plastic tubing. Several of these little pumps are driven by wings up at the front of the animal that flap in the breeze. It takes a few hours, but then the bottles are full. They contain a supply of potential wind. Take off the cap and the wind will emerge from the bottle at high speed. The trick is to get that untamed wind under control and use it to move the animal"
this fellow is sheer genius... i wonder if his ideas could be adapted to harness power and energy and get us off fossil fuels. TED awards are an amazing venue. Yeah he's been hailed as a modern day Leonardo da vinci.It's an interesting concept,i'd love to see how he came up with the idea and then watch it being developed from start to finish. Breathtaking. Thank you for posting this.